Everytable could be a game-changing concept for low-income communities in need of quality food. In modern-day America, nearly every facet of our culture favors the wealthy. From the food we eat, right down to the kind of toilet paper we buy, the poor are often left paying a disproportionate amount of money for an inferior product. But now, in Los Angeles, a new business could soon change that paradigm in the food industry. Everytable—a healthy fast-food chain opening in the notoriously impoverished neighborhood of South LA this Sunday—is disrupting the price structure of typical quick service restaurants. The restaurants will have different menu prices influenced by the median income of the neighborhood, co-founders Sam Polk and David Foster told the New York Times this week. For example, the restaurant's South LA location will offer a Jamaican jerk chicken bowl—the most expensive item on the menu—for just $4.50. But this fall, when Everytable opens a second location in the more affluent neighborhood of downtown LA, the same dish will cost $8.95. "Our first two locations are only about two miles apart, but the needs of each community are so different," Foster, a former private equity executive, told Tech Insider this week. 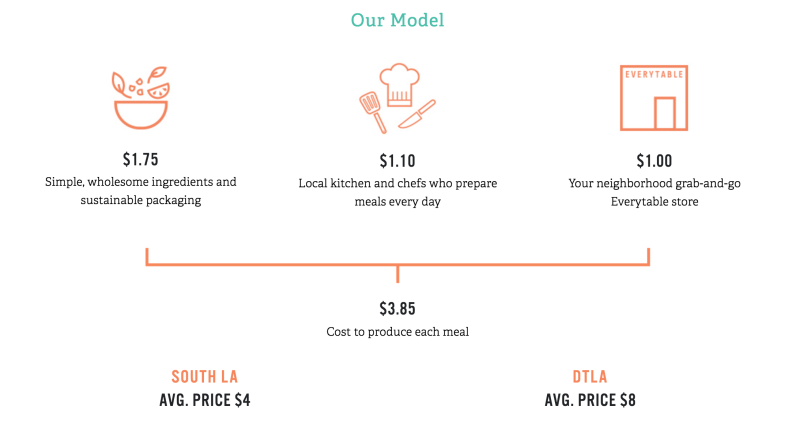 "Why not build a model where everyone can access the same meals at a price that makes sense for them?" Already, the restaurant is drawing comparisons to LocoL—a restaurant founded by Roy Choi, which keeps its prices low and employs teenagers from the neighborhood—and most major fast-food chains vary their prices slightly depending on the location. Still, a company that aims to adjust its prices so drastically, while selling healthy food in the process, could be game-changing in low-income communities. Even so, Polk and Foster don't believe its more expensive restaurant will be subsidizing the location in South LA. Instead, each restaurant is designed to be fully self-supporting. Polk also runs a nonprofit called Groceryships, a program that provides families in LA with gift cards for organic produce, meetings with nutritionists, and health screenings.